A celebration of sorts, marking the 25th anniversary of Pixar Animation Studios, Disney/Pixar’s fast-action, high-octane animated hit Cars 2 is a sequel to the 2006 smash Cars. 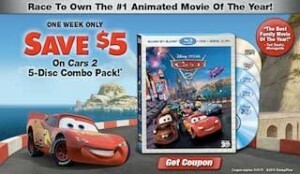 The first Pixar film to be released on Blu-ray 3D, Cars 2 grossed $185 million at the domestic box office. It was directed by John Lasseter, chief creative officer for Walt Disney and Pixar Animation Studios, in Lasseter’s first time back in the driver’s seat as feature-length film director since the 2006 original . The movie focuses on star race car Lightning McQueen and his pal Mater as they head overseas to compete in the World Grand Prix race. But the road to the championship becomes rocky as Mater gets caught up in an intriguing adventure of his own: international espionage. 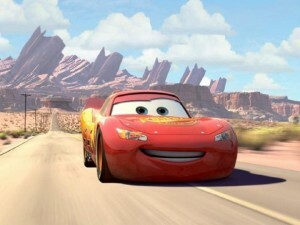 Cars 2 features an all-star vocal cast including Owen Wilson (Hall Pass) who reprises his role as Lightning McQueen; Larry the Cable Guy (Only in America) as Mater; Bonnie Hunt (Cheaper by the Dozen) as Sally, the baby-blue Porsche 911 Carrera whose motor races for Lightning; and Michael Caine (Hurry Sundown) — in his Pixar debut — as Finn McMissile, a top British spy who mistakes Mater for an undercover American agent with a genius disguise. Also making some noise in this movie are Emily Mortimer (City Island), John Turturro (The Big Lebowski), Tony Shalhoub (Feed the Fish), Joe Mantegna (TV’s Criminal Minds), Eddie Izzard (Every Day), Cheech Marin (Machete), John Ratzenberger (Toy Story 3) and Vanessa Redgrave (Letters to Juliet). Plus, real-life Formula 1 racing champ Lewis Hamilton and NASCAR racer Jeff Gordon add a touch of authenticity via cameo appearances. Like all Pixar releases on disc, Cars 2 comes with a handful of exclusive new bonus features. First is “Air Mater,” an animated short featuring the fan favorite character spinning his wheels in an adventure high above the fim’s hometown of Radiator Springs. Other bonus features include a commentary by Lasseter, “Hawaiian Vacation” (the animated short film that accompanied Cars 2 in theaters) and an interactive “World Tour” map that takes viewers through nine locations (including those featured in the film) as well as behind-the-scenes with the Pixar artists and filmmakers as they circle the globe getting inspiration for the film.